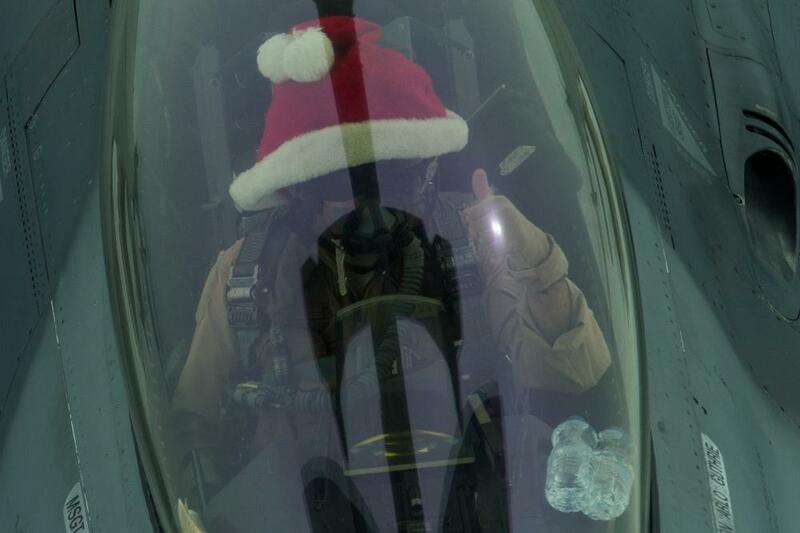 A Vermont Air National Guard F-16 fighter jet, with its pilot wearing a Santa hat, flew air support missions over Iraq on Chirstmas Day. On Christmas Day, a Vermont Air National Guard F-16 fighter jet piloted by a person wearing a Santa hat flew combat missions over Iraq, a bomb fixed to its underbelly, supporting the fight against the so-called Islamic State. A caption provided with a photo of the jet from the Air Force says the aircraft was “providing precision guided close air support". The red Santa hat shows clearly through the cockpit, and the Vermont Air National Guard "Green Mountain Boys" livery is visible on the jet. The Vermont Air National Guard F-16 fighter jets arrived at an unspecified location in “southwest Asia” on Dec. 10, according to the U.S. Air Force, and they’ve been busy ever since taking part in the continuing combat against forces of the so-called Islamic State. Based on a post on The Aviationist blog, the Green Mountain Boys F-16 photographed over Iraq was carrying a “small,” 250-pound bomb. The GBU-39 SDB is a small 250-lb multipurpose, insensitive, penetrating bomb with a blast-fragmentation warhead for stationary targets. It is equipped with deployable wings for extended standoff range that open upon release allowing the GPS-guided bomb to glide for several miles before hitting the target with accuracy: launched at high-speed from high altitude it can travel for as much as 50 miles, allowing the attack plane (be it an F-16, F-15E or AC-130W, the largest aircraft to carry this kind of weapon) to remain outside the range of most SAM (Surface-to-Air Missile) batteries. The deployment is part of Operation Inherent Resolve, a multi-national campaign to fight ISIS in Iraq and Syria. 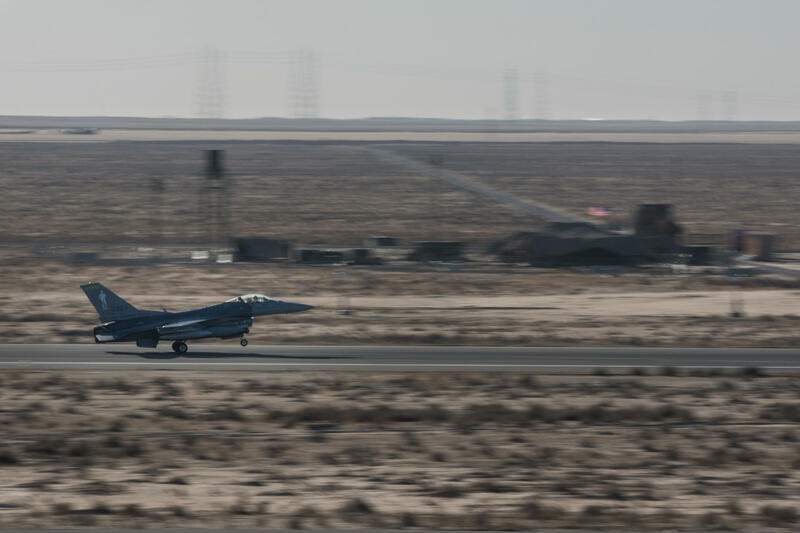 Vermont Air National Guard F-16s arrived at an undisclosed location in "southwest Asia" on Dec. 10 to support Operation Inherent Resolve, a multi-national effort to combat the so-called Islamic State. Along with the jets are 300 Vermont Air National Guard airmen, including pilots and maintenance crews for the aircraft. Military officials have refused to specify which country the Vermont contingent is based in during the deployment or when the jets and personnel will return to Vermont. "I don't think the intent is to be secret," said Vermont Guard spokeswoman Capt. Dyana Allen. "What the intent is, is there are host-nation sensitivities, so that is the real reason that a specific location hasn't been given. But our guardsmen are over there doing incredible things ... and as far as I know, spirits are high so they're doing a great job." Allen said family groups back home worked to provide holiday care packages to the deployed guard members. "It's got to be tough to be deployed on the holiday season, and you know our families are working through that as well, so we're just really wishing them all the best for the holidays, we're making sure that all of our families are being taken care of, and we're reaching out to all them as well," Allen said. 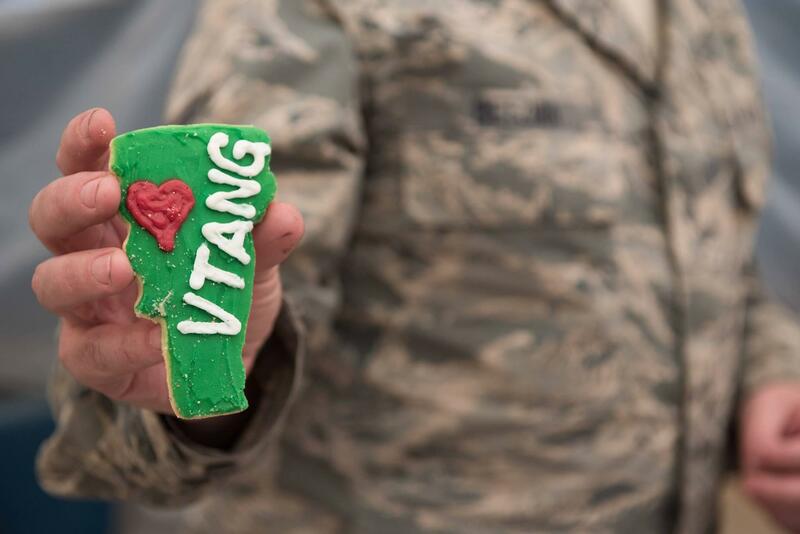 Members of the Vermont Air National Guard deployed to southwest Asia for the holidays received care packages on Christmas Day, including Vermont-shaped cookies. The holiday deployment and the secrecy of the location raised the question: How can gifts, care packages and other mail get to Vermont Air National Guard members if they’re deployed to an undisclosed location? Allen said the secrecy location of the deployment won’t prevent gifts, care packages and letters from making their way to airmen and women. "There's an APO [Air Post Office] system that the military uses whenever we're deployed somewhere, so families can actually - if they have the address, they can send packages to their loved ones. But that's something that has to be given out by the service-member to whoever it is that they'd like to have send a package," she said. The difference between the APO system and normal mail, however, is that the "address" doesn't contain a physical location. Instead, it contains an APO number, resembling a ZIP code, which the military uses to route the mail to the right location, without necessarily sharing the location of the APO publicly. For the deployed Vermont Guard members, for example, mail addressed to the 407th Air Expeditionary Group, 134th Expeditionary Fighter Squadron along with a specialized unit number and APO will get to the deployed members, even if the sender doesn’t know what country the recipient is in. Even without knowledge of exactly where the deployment took the Vermont Air National Guard members, Allen said the community is stepping up to help. "I know there's a lot of people in our community who have reached out to our family readiness groups looking to send cards or that kind of thing, so that's something that our family readiness groups are helping with," Allen said. Vermont Guard spokeswoman Capt. Dyana Allen said the 300 deployed Vermont Air National Guard members are in good spirits despite being away from home for the holidays. Even without sending packages, Allen said the deployment is a community effort, from supporting deployed members' families to employers making do with absent staff, to Guard members' co-workers covering extra shifts. "We're trying to do the best that we can to send out support to all of our community military families, and that really includes everybody," she said. "We're a very small state, and we do get quite a lot of support, and for that I know that everybody is grateful."